"The celebration of Advent is possible only to those who are troubled in soul, who know themselves to be poor and imperfect, who look forward to something greater to come. For these, it is enough to wait in humble fear until the Holy One himself comes down to us, God in the child in the manger. God comes. The Lord Jesus comes. Christmas comes. Christians rejoice!" Executed by the Nazis for his complicity in a plot to assassinate Hitler, Dietrich Bonhoeffer remains with us today through his writings - far-reaching ripples of deep thought, passionate words, and unflinching character. 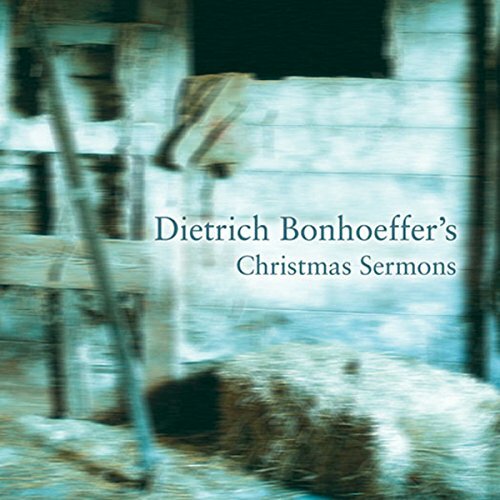 Including biographical insights, Dietrich Bonhoeffer's Christmas Sermons spans Bonhoeffer's 17 years as a preacher. This collection of vintage sermons and writings searches out the power and mystery of the Christmas season: its joyous riches and its implications for our lives. This collection of Bonhoeffer sermons focuses on "Advent Themes" not just those that he really preached during the Advent and the Christmas seasons. These are interesting listening as you can feel the increasing resistance to the Nazi Ideals in his message as time progresses. Much of the focus on economic crisis, homelessness, polarization of ideology sound surprisingly current-- even though I know he is talking about Germany in the 1930's-40's. Bonhoeffer traveled a great deal as a preacher living in the US, Cuba and Spain in addition to Berlin. The back story the author presents is engaging. Bonhoeffer's words are powerful. The problem lies in the narration as the reading is flat and monotone. The sermons run together with the editor/author's writing and the only way I could tell at times that it was no longer Bonhoeffer's words was that the author had started to use the word "he". This was the only signal that there was a shift. I understand that some of the sermons are incomplete as endings have been lost in time--but it was very confusing. The season of Advent is a time of darkness and waiting. To me more along the lines of a hopeful anticipatory waiting. The life presented in these writings is extremely dark and ominous. Overall, this is a terrifying listen. Bonhoeffer uses his preaching to stand up to the Nazi's and Hitler and is executed because of his powerful beliefs and willingness to speak out. Rather than sermons that present positive Christmas thoughts and ideas the reader gets a slice of living history in all its terror. I think it best to understand this at the start. Not sure that more editing might not have helped the book. Plus the narrator's sugar-sweet flat voice reading these powerful words felt creepy to me. Maybe not Christmas? I've never heard a recording of Bonhoeffer's voice but I cannot imagine he'd impact his congregations with a monotone. This would be better if the delivery were more like that of an actual pastor. I'd like more Bonhoeffer sermons, but maybe assign a public speaker to do it next time. I've lived in Germany and played keyboard for a small Christian Science congregation. That was some time ago so that older members who testified had lived through World War II. Sweet people working hard on their lives! I also listened to the audible biography of Bonhoeffer and was much affected by it. He came from a bright, upscale family with high standards and much love. This was a Christian martyr! So I tried to listen to these sermons at Christmas time and could not. Like sawdust. Now I try again and notice how pleased with himself the narrator sounds. Something is wrong. I suspect he does not really "get" the deepest points Bonhoeffer is trying to make! The other reviewers are right; I agree with them completely. Now I must clarify that I converted to Catholicism and nonetheless love Christian teaching from whatever denomination. And now I am midway in the listening and Bonhoeffer is glorifying Mary's lowliness!!! Oh, dear, no! Mary was beautiful and splendid and virtuous and very young and God chose her! She was perfect for His purpose! She had not had time to get into trouble. She was watched over by family and her fiance. A mid-century German may see Mary as lowly; I think God does not. And here I have to stop, much as I love and respect Dietrich Bonhoeffer. Let's not be glorifying humanly perceived lowliness! With a better narrator, I might have been able to hang in there. The words of Bonhoeffer are most powerful , and the narrator Tom Parks narrates this book so well.